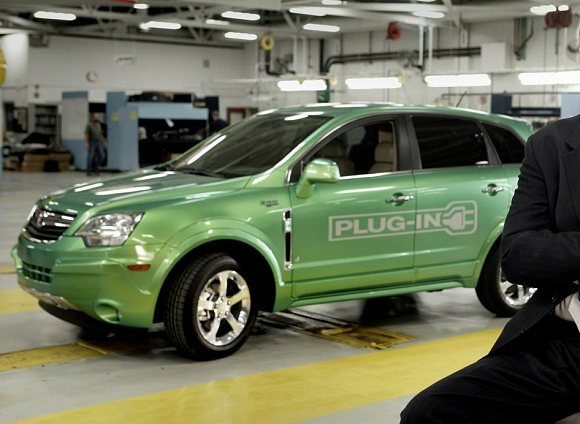 The mid-size Vue crossover will become a Buick in 2011, and a plug-in hybrid will be part of the program. The Two-mode hybrid system that was originally scheduled to launch in the Vue last November will be installed in the Buick-badged version along with an 8 kWh lithium ion battery pack. The pack will use the same LG Chem cells going into the Volt and, as originally planned, the PHEV will be paired with the direct injected 3.6L V6. The new five-passenger crossover will build on the success of the Buick Enclave, offering the brand’s finely crafted execution and premium driving experience in a fuel-efficient package. The Buick crossover will be powered by an Ecotec 2.4L direct-injected 4-cylinder engine with an optional 3.0L direct-injected V6, and is expected to deliver 30 miles per gallon or more on the highway. Final fuel economy estimates, as well as additional vehicle details such as name and pricing, will be announced later. The Buick plug-in hybrid has the potential to achieve double the fuel economy of comparably-sized SUVs on short trips. This significant boost is achieved by combining a modified version of GM’s proven 2-Mode Hybrid system with advanced lithium-ion battery cells and charging technology developed for GM’s Voltec system, which will debut in the Chevrolet Volt extended-range electric vehicle in late 2010. The Buick plug-in hybrid will use the same manganese-spinel based chemistry and polymer battery cells as the Volt. The 8 kwh battery – containing half the energy of the Volt battery pack – will be packaged in a rectangular-shaped box under the cargo floor. On the road, GM’s 2-Mode plug-in hybrid system can use any combination of electric or gasoline engine power to move the vehicle, depending on the driving conditions. This differs from GM’s Voltec technology, which provides the Volt with up to 40 miles of emissions- and petroleum-free electric-only propulsion, and an overall range of more than 300 miles with its flex-fuel engine-generator. In addition to the lithium-ion battery pack, the Buick plug-in hybrid’s powertrain features two powerful electric motors, sophisticated electronic controls and battery management systems and an efficient direct-injected 3.6L V6 flex-fuel engine. Very much helpful dispatch but there are some point where I will not agree. But all-inclusive its very good.